I grabbed this one off the shelf of my library cold. That is to say, I had never heard of it before, but it looked like it could be fun. It was! Jack & Benny, brothers, aren't particularly thrilled to be spending the summer in Maine without a television. 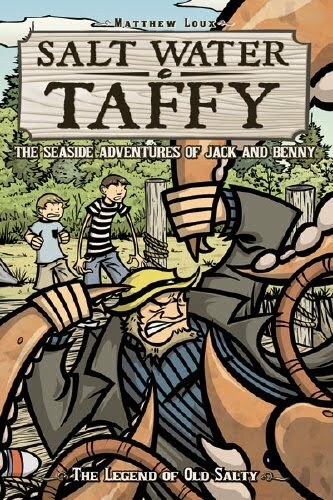 At least the town has a store that stocks scrumptious salt water taffy. When all of the taffy goes missing, they team up with local fisherman Angus O'Neil to catch a thief. Very cool. Super quick, fun read. We mostly stick with Jack & Benny, but we get a few other perspectives that enhance the story nicely. I could see my younger brother (and other upper-elementary kids) enjoying the series. Recommended.